Below are two accounts by eyewitness observers of the May 20, 2018 presidential election in Venezuela. They are written by Daniel Kovalik from Pittsburgh, USA and Vinnie Molina from Western Australia. Below their texts are several recommended additional readings. Voter turnout was 46 per cent. Many right-wing political forces called for a boycott of the election. I just returned from observing my fourth election in Venezuela in less than one year. Jimmy Carter has called Venezuela’s electoral system “the best in the world,” and what I witnessed was an inspiring process that guarantees one person, one vote, and includes multiple auditing procedures to ensure a free and fair election. Daniel Kovalik teaches international human rights at the University of Pittsburgh Law School. His most recent book is ‘The Plot to Attack Iran’. 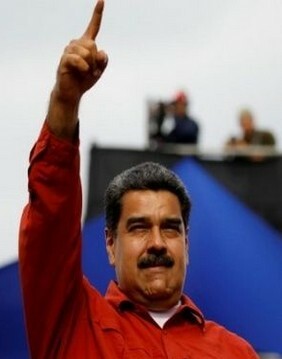 The Bolivarian Revolution in Venezuela shall overcome! At the invitation of the Bolivarian Republic of Venezuela’s Foreign Affairs Ministry, I had the opportunity to witness the historic presidential election in Venezuela on Sunday, May 20. I represented the Western Australia branch of the CFMEU (Construction, Forestry, Maritime, Mining and Energy Union). The long journey to Venezuela from Australia was well worth to learn a lesson in participatory democracy. The Venezuelan people were out there casting their vote in an environment of self- determination and love of their country. Arriving on the wee hours of Saturday 19th May, observer delegates numbering around 400 were up at 5am on May 20 to act as witnesses to the event. Delegates were first taken to the National Electoral Council’s Production and Distribution Centre, where more than 34,000 electronic voting machines are built, tested, audited and distributed to every corner of the country. We were welcomed by electoral authorities and the workers who were in charge of the huge responsibility. Workers gave us a guided tour of the massive warehouse, showing us the different models of the voting machines with an explanation of the safety features of the system that is employed to ensure a safe electoral tool. We had the opportunity to put the equipment through its paces to verify its reliability. Electoral staff patiently answered the many questions from delegates. One of the safety features was an inbuilt source of power to keep voting machines running in the case of an expected blackout. The machines are protected from hacking because they do not have access to the internet and are only enabled to send data after polling booths are closed. Members of the political parties, scrutineers and members of the public who wish to participate in the counting and auditing process can be fully satisfied with the process. It incorporates crosschecking electronic results with the paper receipts provided by the machine to each elector which are deposited in a ballot box. The voting process starts with electors arriving at their designated polling place where they are required to show an ID card then the voting machine is accessed with their finger print. The machine identifies the person and it only opens if the data matches the elector’s finger print. There is no way a person would be able to vote more than once. The vote is secret and the process witnessed by electoral authorities and members of the political parties participating in the election. All personnel involved in the election day are volunteers from the public chosen randomly in a similar way to how Australians are chosen for jury service. On election day, polling booths were to open from 6 am to 6 pm. If there were people still queueing after 6 pm, polls would remain open until the last person had cast their vote. On this occasion, it meant some polling places did not close until 8 pm. The electoral process in Venezuela is voluntary. Despite that, there is a sense of personal responsibility and the people freely participate at high levels. On Sunday 20th May, delegates were up at 4 am and on several buses by 5 am. We were taken to several polling places to witness the process. We were encouraged to ask any questions we might have, take photos or interview electoral officials or the people. I was impressed with how politically aware were the Venezuelan people to whom we spoke. Their views of the process, the problems they face, and for most their pride in self determination and trust in the future were evident. Most of the people were aware of the country’s immense problems, in particular the economic crisis and the enormous external pressure put on the country by the United States and its allies. They were very concerned about the declaration of the ‘Lima Group’ of 14 countries calling for a ‘humanitarian’ intervention. That call openly supports the U.S. threats of regime change in Venezuela. As a result of the U.S. economic and financial blockade, the Bolivarian government has been unable to get hard currency to purchase food and medicines. The economic blockade is hitting the general population hard and they must struggle just to satisfy their basic needs on a daily basis. The U.S. policies aiming at regime change contributes also to the hyperinflation which has sent the local currency, the Bolivar, through the roof. It is an economic war driving the effect that workers’ wages aren’t enough to satisfy their basic needs, despite the government’s continuous salary increases. For example, a kilo of meat cost about four million Bolivars–roughly equivalent to three to four U.S. dollars. The minimum wage is equals to US$3 per month, based on the exchange rate dictated by the black market. Most people manage to survive through the efforts of President Nicolas Maduro and his government which provides the people with a basic supply of food and cheap utilities such as gas, electricity, public transport and fuel. The government has also built more than two million homes, securing a roof over the head of the many poor Venezuelans. All of these measures are endorsed by the majority of the people who support their government. Some of President Maduro’s supporters are also critical and expect more from his government, but they are not seeking or supporting any foreign intervention in their homeland. President Nicolas Maduro was reelected with more than 6.7 million votes, or 68 per cent, followed by the opposition candidate Henri Falcon who received 1.9 million votes, or 20 per cent. The other two running candidates received lesser returns. All international observers and members of political parties attended the Venezuelan Electoral Council offices to listen to the official results from its Director Tibisay Lucena. At 10 pm and with 92 per cent of the results available, President Nicolas Maduro was declared the winner for a new six year period until 2025. The opposition candidate Falcon issued a statement calling for a new election, citing a low voter turnout as the reason. Only 48 per cent of those eligible cast their vote, but Falcon forgot to mention that the opposition had called its supporters to boycott the election and not to vote. In the view of many, the process was legitimate and free of any incidents. The Venezuelan people cast their vote against violence and for peace. They also demand President Maduro fix the economy and defend their country from foreign intervention. On Monday 21st May, delegates gave a press conference and issued a statement in support of the results and congratulated President Nicolas Maduro for his reelection. Delegates condemn the U.S. economic blockade designed to hurt the people and the government. They also condemned the Lima Declaration which calls for a humanitarian intervention in Venezuela. During our stay, delegates were able to meet with many Venezuelans as well as with members of the trade unions who thanked us for our visit and solidarity. I feel proud the CFMEU WA branch was represented. Bolivarian trade unionists expressed their desire to develop further fraternal relations. Workers I spoke to were horrified to hear of the struggle faced by construction workers in Australia, particularly the special legislation that criminalises legitimate trade union activity, and the secondary boycott provisions of the Australian Building and Construction Commission, and the lack of the right to strike. They were surprised to hear reports that Australia isn’t the democracy they expect from a first world country. A message of solidarity was sent to the Aboriginal traditional custodians of the land. The struggle for land rights in Australia is well understood in Latin America, where indigenous people were also disposed from their lands. I would like to conclude by expressing my solidarity with the Venezuelan people and its government. I congratulate President Nicolas Maduro for his reelection and l encourage the readers to also express their solidarity with Venezuela and call on the Australian government to recognise the election process of 20th May that reelected President Nicolas Maduro. Many declarations have been issued by the anti-Venezuela ‘Lima Group’ of 14 Latin American countries plus Canada. Here is a ‘Lima Declaration‘ dated August 8, 2017, signed by Argentina, Brazil, Canada, Chile, Colombia, Costa Rica, Guatemala, Honduras, Mexico, Panama, Paraguay and Peru. The Western critics hoping to see the demise of Venezuela’s socialist government are located not only on the right of the political spectrum. They also sit on the left. The Trotskyist World Socialist Website, for example, informed its readers in a May 22 article that the May 20 election shows that support for Venezuela’s socialist government has “tumbled”. The article concluded with a dire warning of “the inadequacy of chavismo“. An earlier commentary the same month by the same publication catalogued what is called the ‘betrayal by left nationalism‘ of successive Venezuelan governments under presidents Hugo Chávez (who died of cancer in 2013) and Nicholas Maduro. The New Politics online publication in the U.S. published a call by U.S. academic Chris Carlson not to vote for what he called “the corrupt and authoritarian Maduro regime” in the May 20 election.